Bolder is Martin Maischein who used to record as Henrich at Hart on Position Chrome and Peter Votava also known as Pure who has recorded previously for Mego and was half of Ilsa Gold. 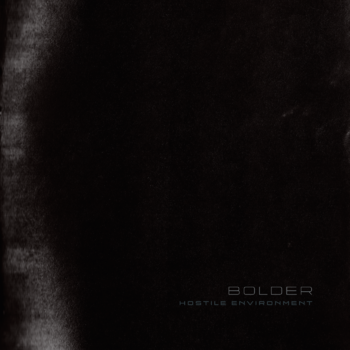 With their combined background in electronic music of all angles Bolder introduces a significant proposition to the current experimental electronic boom. Blurring the lines between industrial, techno, dub, ambient and narrative forms, the work on Bolder's debut presents a dance amongst the abyss, a world where organic rhythms provide the path amongst a swarm of foreboding electronics. Herein lurks an atmosphere where hostile electronics weigh the hope and paranoia of today's climate. One humans listen is another humans challenge.